Concentrated solar power is essential for generating electricity in larger scale. According to the recent statement made by the new American President-elect, Barrack Obama, <?xml:namespace prefix = st1 ns = "urn:schemas-microsoft-com:office:smarttags" />United States would be getting electricity from alternative energy sources that include solar power to the tune of 25% of the total energy requirement by 2020. Concentrated solar energy will no doubt go a long way towards achieving that goal. Concentrating solar power (CSP) technologies use specially made mirrors to reflect and concentrate the rays of the sun onto receivers which accumulate the solar energy and convert it to heat energy. The thermal energy thus collected is then used to produce electricity through a steam turbine or heat engine driven power generator. Linear concentrating solar power system or CSP capture the rays of the sun with large mirrors and direct it onto linear receiver tubes that contain fluids which get heated by the rays, eventually producing steam that charges the turbine which drives a generator producing electricity. However, there are two basic forms of linear concentrator systems – Parabolic Trough Systems and Linear Fresnel Reflector systems. The Dish/Engine system of concentrating solar power is not very effective since it can generate power in range of 3 to 25 kilowatts. Here a parabolic dish of mirrors concentrates and focuses sunrays onto a central engine which produces electricity. In the Power Tower System of concentrating solar energy, numerous hefty, flat sun-tracking mirrors that are technically called Heliostats focus sunlight onto a receiver at the top of a tower. While heat transfer fluids heated in the receiver is used to generate steam, water/steam alternatives are also often utilized to run the turbines. Some systems also use molten nitrate salts for superior heat transfer. The biggest hurdle that all solar energy systems face is stoppage of all activity as soon as the sun goes down or become covered with clouds. However, it has been observed that when the receiver contains oil or molten salt as the heat transfer medium, the thermal energy remains stored for later use. Thermal Storage Research is currently being conducted in the United States as an answer to this problem. 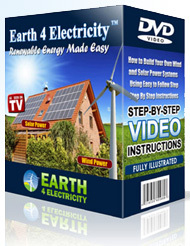 There are many great advantages of solar power and that is why this is becoming so popular. To begin with, this is eco friendly. Secondly, there are many alternative energy incentives too from local authorities. This renewable energy source can save you lots of money on your electricity bills – so this is cheaper too. Given all this, it makes sense to opt for solar power. But to do that you will have to know where to set up a system in your home and how to install and wire it. You will also have to know where to get cheap parts from and also the safety precautions.